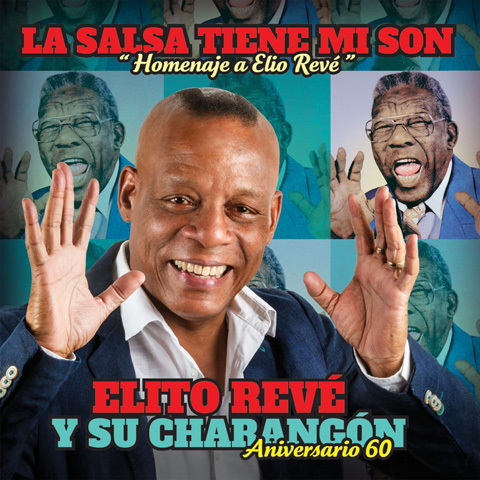 CD REVIEW: La Salsa Tiene Mi Son "Homenaje a Elio Revé"
Review by Bill Tilford, all rights reserved. 2016 marks the 60th anniversary of the foundation of Elio Revé y su Charangón (aka Orquesta Revé) by Elio Revé Matos of Guantanamo (23 June 1930-24 July 1997). His son Elito Revé has directed the orchestra since his death, and this recording commemorates 60 years of the Orchestra. It's impossible to exaggerate the importance of the Charangón to modern Cuban dance music. Not only did it take Changüi, a folkloric form that has been around forever, in new directions, it also played an important role in the development of many of the musicians who later formed other important orchestras including Los Van Van (including Juan Formell himself), Ritmo Oriental and Dan Den (including Juan Carlos Alfonso, who contributes a few arrangements to this new recording) among others. Kevin Moore has more to say about the role of Revé here. This recording is not a full historical retrospective; rather it focuses heavily on the 1980s and 1990s, but the selections are excellent, and the many guest vocalists and musicians fit perfectly. The title of the album is a bit of a play on the song Mi Salsa Tiene Sandunga, which is also the first track. This album won both one of the two Gran Premio awards and the category Música Bailable - Maestros in Cubadisco 2016. The music is still fresh enough that the Charangon may have another 60 years in it. Vocal and Coros Susel Orietta Gómez Pérez "La China", Dagoberto Vázquez Valdés "El Clásico", Serguei Yera Madera "El Moro", Lázaro Maya Morejón "Lachy Fortuna"